Aso City may not make Japan's national news much, but Aso Shrine is considered one of Japan's three most famous "romon" shrines—shrines with an impressive, ornate two-tiered gate. Note that this picture isn't of the actual shrine itself; just the entryway. I'll post pictures of the actual shrine, and other sights on the shrine grounds, over the next few days. Registered as a World Heritage Site, Nikko's Toshogu Shrine is the resting place of Tokugawa Ieyasu (1543-1616), founder of the Tokugawa Shogunate and one of the most important figures of Japan's samurai era. He asked to be buried at the Toshogu Shrine so his spirit could watch over the land. 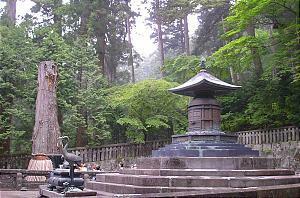 Some years later, residents of sacred Nikko discovered natural hot springs in the neighboring Kinugawa-Kawaji area. Today, in the Kinugawa-Kawaji hot spring resort area, you can still enjoy the same simple yet mysterious natural beauty that so enthralled Shogun Ieyasu hundreds of years ago. The tomb of Ieyasu at the Toshogu Shrine. Green tea is getting even "greener" as more and more tea companies are emphasizing sustainability. Even Unilever, the world's largest tea company, is getting in on the act. Mellow Monk is all for sustainable tea-growing practices, and our growers in Aso, Japan, are all certified under Japan's Eco Farmer Program. Women need hugs, but guys have their needs, too. No, not beer and football, but verbal praise. "The more I read about them, the less I understand them." The Tokyo National Museum has an easy-to-navigate online archive of its extensive collection of Japanese and other Asian works, which can be browsed by type or by region. 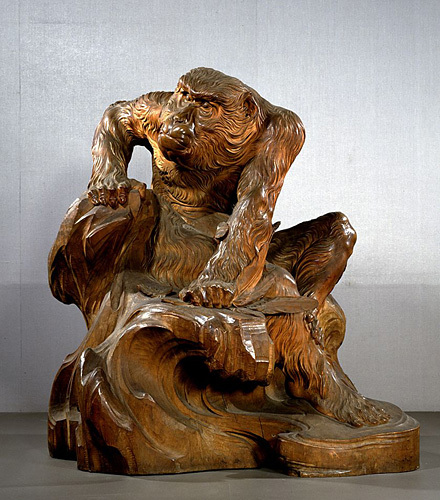 "Aged Monkey," by Takamura Koun (1852-1934). If you live in, or will be traveling to, the San Francisco Bay Area, and you're a fan of Japanese manga (comics), you may want to check out the Asian Art Museum's exhibit on renowned Japanese animator Osamu Tezuka, who is often called the "Walt Disney of Japan." A scene from Tezuka Osamu's "Jungle Emperor" comic, one of many featured at the San Francisco Asian Art Museum's exhibit on the pioneering Japanese animator. History of tea in the U.S.
WhatsCookingAmerica.net has an interesting history of tea in the United States. English and American cookbooks shows us that tea has been served cold at least since the early nineteenth century, when cold green tea punches, that were heavily spiked with liquor, were popularized. So remember, if you're enjoying, say, a nice ginger green tea hot toddy, you're carrying on an old American tradition. They're not actually crop circles, because no one in the town of Inakadate purports that the giant rice-field artwork was left by extraterrestrials. Instead, the townspeople freely admit that they created the pictures by planting a darker-colored variety of rice alongside the traditional green rice. What they don't freely admit is that the whole thing is probably a publicity stunt, but at least it's not too tacky. And I'm guessing that the rice harvested from this "tambo art" ("rice field art") is bagged and sold at a premium. Finally, some comments on the linked-to Pink Tentacle page raise accusation of Photoshopping, but at its official website and blog, Inakadate officials freely admit to being instigators of the whole phenomenon. The work of alien beings? No, it's the work of the mayor's office. In the days of the Shogun and his samurai, the area of Tokyo known as Honjo, in Sumida Ward, was an eerie, desolate place. Lonely farmhouses were scattered among vast fields that transformed into oceans of darkness at night. This famously creepy landscape gave birth to various scary tales, each usually tied to a particular place. The most renowned of these folktales came to be known as the "Seven Mysteries of Honjo." Over time, some of the original seven tales were replaced with different ones, and new renditions of old tales also evolved, so in the end the final count exceeded seven, although the "Seven Mysteries" name was retained. One of the most well-known of these Honjo mysteries is about a haunted fishing spot known as the Oiteke-Bori. Oiteke-Bori was a secluded spot on the banks of a canal where fish could be caught with amazing ease. In the evening, fishermen would drop their lines into the water and start pulling out fish, one after another. A fishermen would keep his catch alive in a closed wicker basket hung in the water, but just as he was about to go home with his fish, a disembodied voice from out of nowhere would angrily command, "Leave them here! Leave them here!" ("Oiteke! Oiteke!"). Anyone who heard the voice would flee in terror, but sometimes a fisherman would grab his basket of fish before running off. On the way home, however, he would suddenly find himself feeling weak at the knees—and realize that the fish had mysteriously vanished from his basket. Soon word began to spread about the haunted fishing spot, and the voice's command became the location's name—Oiteke-Bori, the Leave-Them-Here Fishing Spot. So popular was this legend that a slight variation of the name, oitekibori, became part of the Japanese language, meaning to be suddenly abandoned or left behind. A depiction of the spirit that was said to haunt the "Leave Them Here" fishing spot in the Sumida district of Tokyo hundreds of years ago. The supposedly haunted canal, now filled in, once flowed along the road in front of the Tsugaru Inari Shrine, located near Kinshicho Station in Tokyo. The blog is staying here! Previously I had announced that I was moving my blog to another location. Well, that just isn't working out, so will be "re-activating" this old blog. I apologize for the confusion. Thanks for your patience!